This chapter gives a start on some applications of the DFT. First, we work through a progressive series of spectrum analysis examples using an efficient implementation of the DFT in Matlab or Octave. The various Fourier theorems provide a ``thinking vocabulary'' for understanding elements of spectral analysis. Next, the basics of linear systems theory are presented, relying heavily on the convolution theorem and properties of complex numbers. Finally, some applications of the DFT in statistical signal processing are introduced, including cross-correlation, matched filtering, system identification, power spectrum estimation, and coherence function measurement. A side topic in this chapter is practical usage of matlab for signal processing, including display of signals and spectra. Practical implementations of the DFT are usually based on one of the Cooley-Tukey ``Fast Fourier Transform'' (FFT) algorithms .8.1 For this reason, the matlab DFT function is called `fft', and the actual algorithm used depends primarily on the transform length .8.2 The fastest FFT algorithms generally occur when is a power of 2. In practical audio signal processing, we routinely zero-pad our FFT input buffers to the next power of 2 in length (thereby interpolating our spectra somewhat) in order to enjoy the power-of-2 speed advantage. Finer spectral sampling is a typically welcome side benefit of increasing to the next power of 2. Appendix A provides a short overview of some of the better known FFT algorithms, and some pointers to literature and online resources. 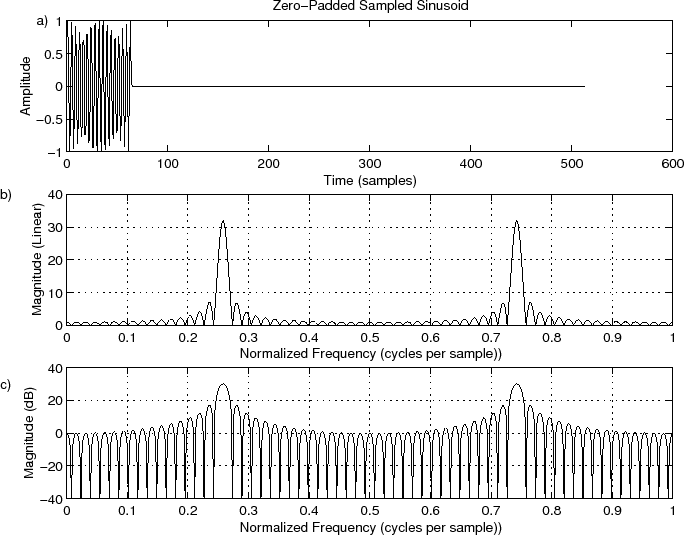 Figure 8.4: Zero-padded sinusoid at frequency cycles/sample. a) Time waveform. b) Magnitude spectrum. c) DB magnitude spectrum. Figure 8.4 shows the zero-padded data (top) and corresponding interpolated spectrum on linear and dB scales (middle and bottom, respectively). We now see that the spectrum has a regular sidelobe structure. On the dB scale in Fig.8.4c, negative values are now visible. In fact, it was desirable to clip them at dB to prevent deep nulls from dominating the display by pushing the negative vertical axis limit to dB or more, as in Fig.8.1c (page ). This example shows the importance of using zero padding to interpolate spectral displays so that the untrained eye will ``fill in'' properly between the spectral samples. As Fig.8.4a suggests, the previous example can be interpreted as using a rectangular window to select a finite segment (of length ) from a sampled sinusoid that continues for all time. In practical spectrum analysis, such excerpts are normally analyzed using a window that is tapered more gracefully to zero on the left and right. In this section, we will look at using a Blackman window 8.3on our example sinusoid. The Blackman window has good (though suboptimal) characteristics for audio work. Many other standard windows are defined as well, including hamming, hanning, and bartlett windows. 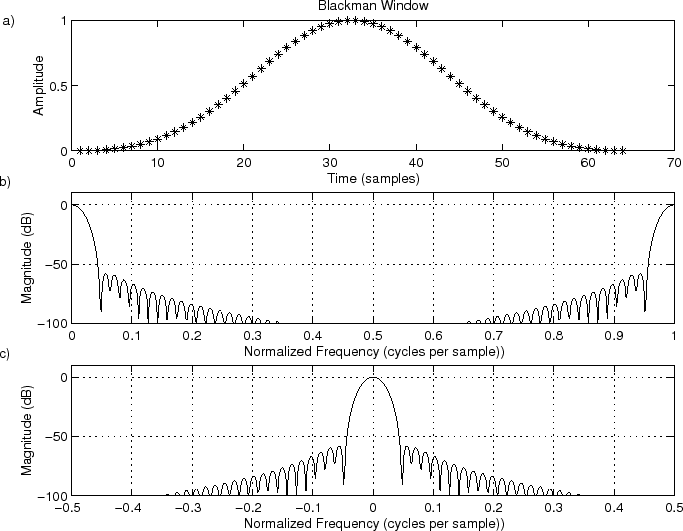 Figure 8.5: The Blackman window: a) window itself in the time domain, b) dB magnitude spectrum plotted over normalized frequencies , and c) same thing plotted over . 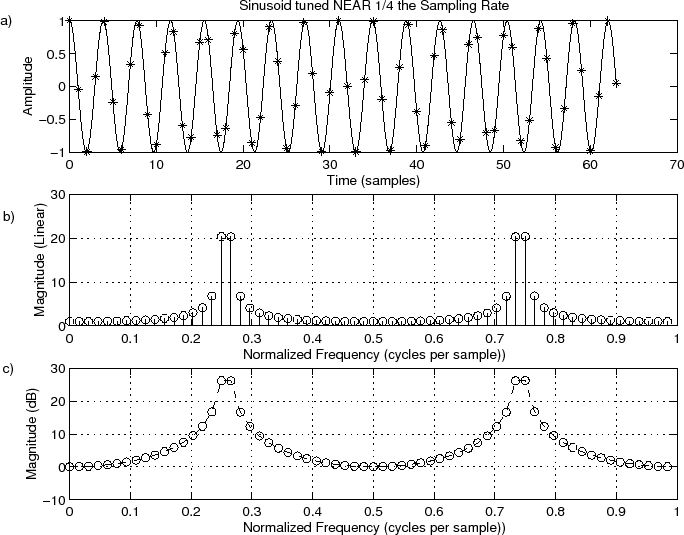 In this example, we'll perform spectrum analysis on a complex sinusoid having only a single positive frequency. We'll use the Hann window (also known as the Hanning window) which does not have as much sidelobe suppression as the Blackman window, but its main lobe is narrower. Its sidelobes ``roll off'' very quickly versus frequency. Compare with the Blackman window results to see if you can see these differences. 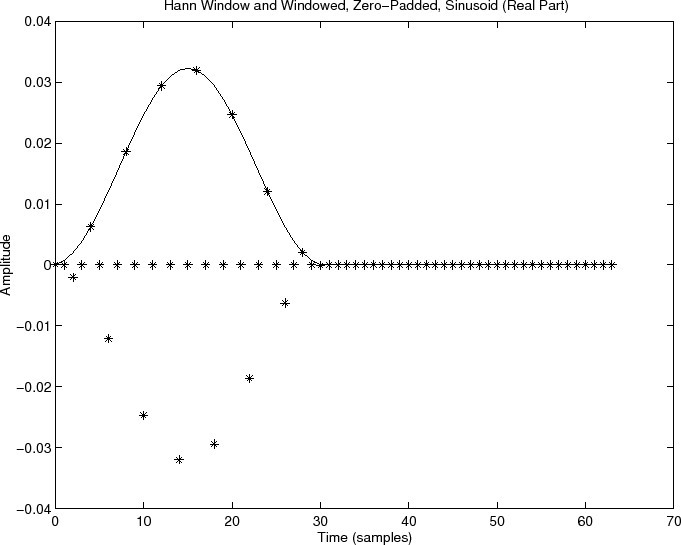 The resulting plot of the Hann window and its use on sinusoidal data are shown in Fig.8.7. Figure 8.7: A length 31 Hann window (``raised cosine'') overlaid with the real part of the Hann-windowed complex sinusoid. Zero-padding is also shown. 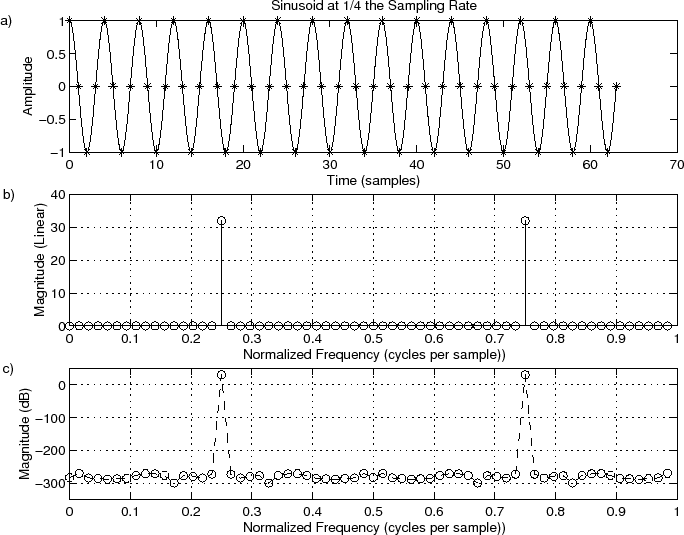 The sampled sinusoid is plotted using `*' with no connecting interpolation lines. You must now imagine the continuous real sinusoid (windowed) threading through the asterisks. Finally, the Matlab for computing the DFT of the Hann-windowed complex sinusoid and plotting the results is listed below. To help see the full spectrum, we also compute a heavily interpolated spectrum (via zero padding as before) which we'll draw using solid lines. 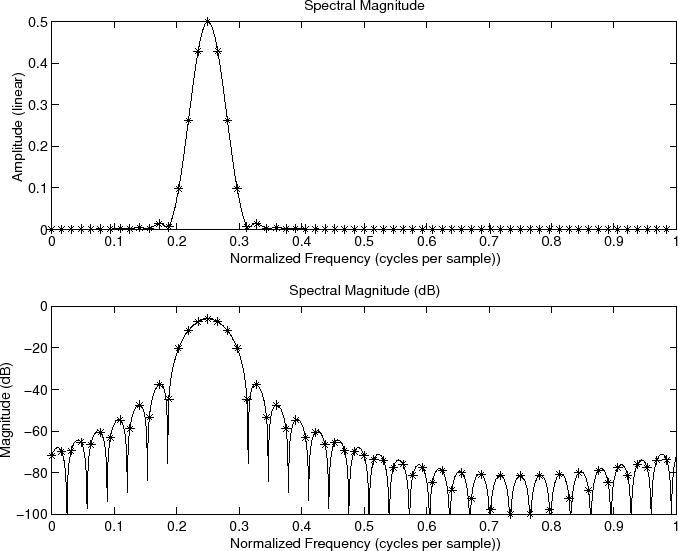 Figure 8.8 shows the spectral magnitude and Fig.8.9 the spectral phase. Figure 8.8: Spectral magnitude on linear (top) and dB (bottom) scales. There are no negative-frequency components in Fig.8.8 because we are analyzing a complex sinusoid , which has frequency only, with no component at . Notice how difficult it would be to correctly interpret the shape of the ``sidelobes'' without zero padding. The asterisks correspond to a zero-padding factor of 2, already twice as much as needed to preserve all spectral information faithfully, but not enough to clearly outline the sidelobes in a spectral magnitude plot. As for the phase of the spectrum, what do we expect? We have chosen the sinusoid phase offset to be zero. The window is causal and symmetric about its middle. Therefore, we expect a linear phase term with slope samples (as discussed in connection with the shift theorem in §7.4.4). Also, the window transform has sidelobes which cause a phase of radians to switch in and out. Thus, we expect to see samples of a straight line (with slope samples) across the main lobe of the window transform, together with a switching offset by in every other sidelobe away from the main lobe, starting with the immediately adjacent sidelobes. In Fig.8.9(a), we can see the negatively sloped line across the main lobe of the window transform, but the sidelobes are hard to follow. Even the unwrapped phase in Fig.8.9(b) is not as clear as it could be. This is because a phase jump of radians and radians are equally valid, as is any odd multiple of radians. In the case of the unwrapped phase, all phase jumps are by starting near frequency . Figure 8.9(c) shows what could be considered the ``canonical'' unwrapped phase for this example: We see a linear phase segment across the main lobe as before, and outside the main lobe, we have a continuation of that linear phase across all of the positive sidelobes, and only a -radian deviation from that linear phase across the negative sidelobes. In other words, we see a straight linear phase at the desired slope interrupted by temporary jumps of radians. To obtain unwrapped phase of this type, the unwrap function needs to alternate the sign of successive phase-jumps by radians; this could be implemented, for example, by detecting jumps-by- to within some numerical tolerance and using a bit of state to enforce alternation of with . To convert the expected phase slope from ``radians per (rad/sec)'' to ``radians per cycle-per-sample,'' we need to multiply by ``radians per cycle,'' or . Thus, in Fig.8.9(c), we expect a slope of radians per unit normalized frequency, or radians per cycles-per-sample, and this looks about right, judging from the plot. 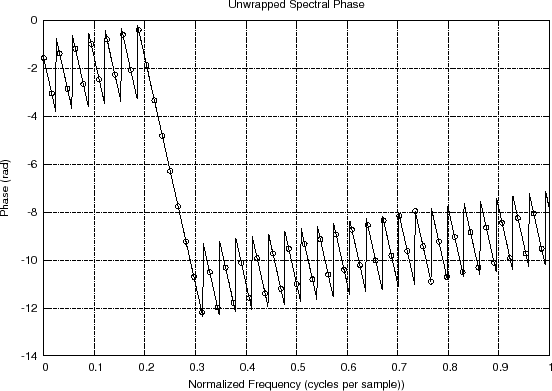 Figure 8.9: Spectral phase and two different phase unwrappings. 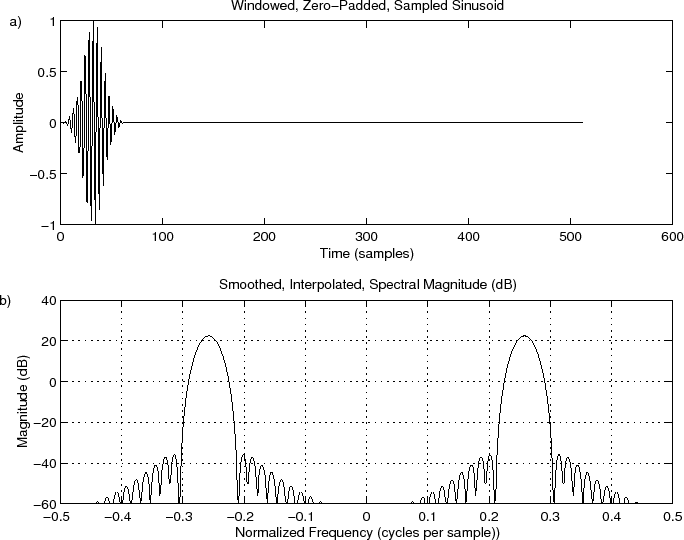 The spectrogram is a basic tool in audio spectral analysis and other fields. It has been applied extensively in speech analysis [18,64]. The spectrogram can be defined as an intensity plot (usually on a log scale, such as dB) of the Short-Time Fourier Transform (STFT) magnitude. 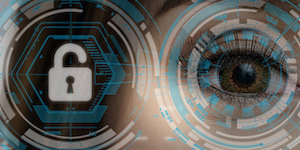 The STFT is simply a sequence of FFTs of windowed data segments, where the windows are usually allowed to overlap in time, typically by 25-50% [3,70]. It is an important representation of audio data because human hearing is based on a kind of real-time spectrogram encoded by the cochlea of the inner ear . The spectrogram has been used extensively in the field of computer music as a guide during the development of sound synthesis algorithms. When working with an appropriate synthesis model, matching the spectrogram often corresponds to matching the sound extremely well. 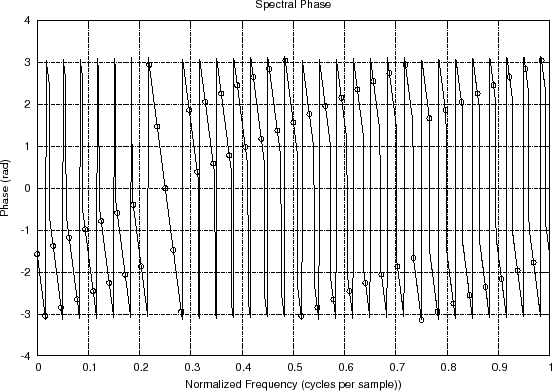 In fact, spectral modeling synthesis (SMS) is based on synthesizing the short-time spectrum directly by some means . 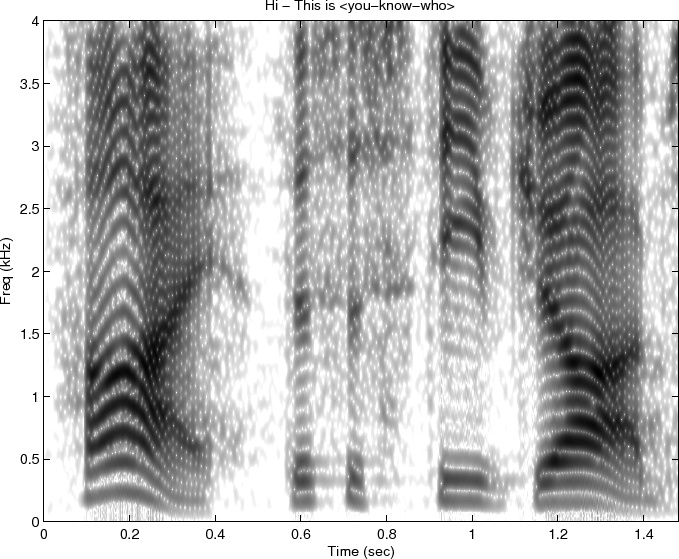 Figure 8.10: Classic spectrogram of a speech sample. An example spectrogram for recorded speech data is shown in Fig.8.10. It was generated using the Matlab code displayed in Fig.8.11. The function spectrogram is listed in §I.5. The spectrogram is computed as a sequence of FFTs of windowed data segments. The spectrogram is plotted by spectrogram using imagesc. Figure 8.11: Matlab for computing a speech spectrogram. In this example, the Hamming window length was chosen to be 20 ms, as is typical in speech analysis. This is short enough so that any single 20 ms frame will typically contain data from only one phoneme,8.6 yet long enough that it will include at least two periods of the fundamental frequency during voiced speech, assuming the lowest voiced pitch to be around 100 Hz. The harmonics should be resolved. Pitch and formant variations should be closely followed. The formants in speech are the resonances in the vocal tract. They appear as dark groups of harmonics in Fig.8.10. The first two formants largely determine the ``vowel'' in voiced speech. In telephone speech, nominally between 200 and 3200 Hz, only three or four formants are usually present in the band. The topics touched upon in this section are developed more fully in the next book  in the music signal processing series mentioned in the preface. The correlation operator (defined in §7.2.5) plays a major role in statistical signal processing. For a proper development, see, e.g., [27,33,65]. This section introduces only some of the most basic elements of statistical signal processing in a simplified manner, with emphasis on illustrating applications of the DFT. (Note that the ``lag'' is an integer variable, not the constant .) The DFT correlation operator ` ' was first defined in §7.2.5. The term ``cross-correlation'' comes from statistics, and what we have defined here is more properly called a ``sample cross-correlation.'' That is, is an estimator8.8 of the true cross-correlation which is an assumed statistical property of the signal itself. This definition of a sample cross-correlation is only valid for stationary stochastic processes, e.g., ``steady noises'' that sound unchanged over time. The statistics of a stationary stochastic process are by definition time invariant, thereby allowing time-averages to be used for estimating statistics such as cross-correlations. For brevity below, we will typically not include ``sample'' qualifier, because all computational methods discussed will be sample-based methods intended for use on stationary data segments. The last equality above follows from the correlation theorem (§7.4.7). When is real, its autocorrelation is real and even (symmetric about lag zero). 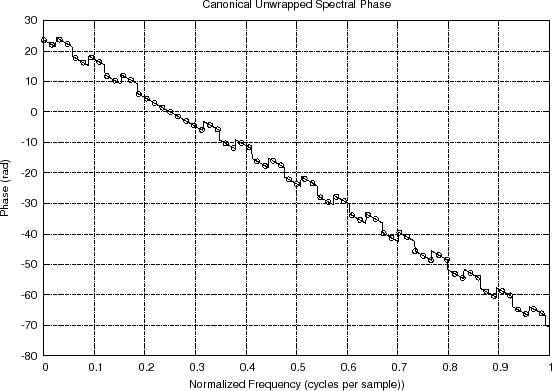 We could call a ``sampled sample power spectral density''. since the projection of random, zero-mean noise onto is small with probability one. Another term for this process is matched filtering. The impulse response of the ``matched filter'' for a real signal is given by .8.11 By time-reversing , we transform the convolution implemented by filtering into a sliding cross-correlation operation between the input signal and the sought signal . (For complex known signals , the matched filter is .) We detect occurrences of in by detecting peaks in . In the same way that FFT convolution is faster than direct convolution (see Table 7.1), cross-correlation and matched filtering are generally carried out most efficiently using an FFT algorithm (Appendix A). Estimating an impulse response from input-output measurements is called system identification, and a large literature exists on this topic (e.g., ). where multiplication and division of spectra are defined pointwise, i.e., . A Matlab program illustrating these relationships is listed in Fig.8.13. Figure 8.13: FIR system identification example in matlab. % of a filter given its input and output. % This is called "FIR system identification". where `` '' denotes time averaging across blocks (or ``frames'') of data indexed by . The function pwelch implements Welch's method in Octave (Octave-Forge collection) and Matlab (Signal Processing Toolbox). 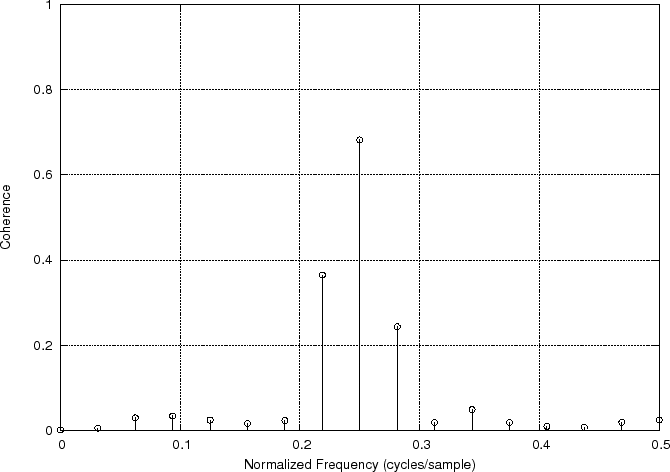 Recall that which is circular (cyclic) autocorrelation. To obtain an acyclic autocorrelation instead, we may use zero padding in the time domain, as described in §8.4.2. That is, we can replace above by .8.12Although this fixes the ``wrap-around problem'', the estimator is still biased because its expected value is the true autocorrelation weighted by . This bias is equivalent to multiplying the correlation in the ``lag domain'' by a triangular window (also called a ``Bartlett window''). The bias can be removed by simply dividing it out, as in Eq. (8.2), but it is common to retain the Bartlett weighting since it merely corresponds to smoothing the power spectrum (or cross-spectrum) with a sinc kernel;8.13it also down-weights the less reliable large-lag estimates, weighting each lag by the number of lagged products that were summed. Since , and since the DFT is a linear operator (§7.4.1), averaging magnitude-squared DFTs is equivalent, in principle, to estimating block autocorrelations , averaging them, and taking a DFT of the average. However, this would normally be slower. We return to power spectral density estimation in Book IV  of the music signal processing series. Note that the averaging in the numerator occurs before the absolute value is taken. On the other hand, when and are uncorrelated (e.g., is a noise process not derived from ), the sample coherence converges to zero at all frequencies, as the number of blocks in the average goes to infinity. A common use for the coherence function is in the validation of input/output data collected in an acoustics experiment for purposes of system identification. For example, might be a known signal which is input to an unknown system, such as a reverberant room, say, and is the recorded response of the room. Ideally, the coherence should be at all frequencies. However, if the microphone is situated at a null in the room response for some frequency, it may record mostly noise at that frequency. This is indicated in the measured coherence by a significant dip below 1. An example is shown in Book III  for the case of a measured guitar-bridge admittance. A more elementary example is given in the next section. Note that more than one frame must be averaged to obtain a coherence less than one. For example, changing the cohere call in the above example to ``cxyN = cohere(x,y,N);'' produces all ones in cxyN, because no averaging is performed. We are now finished developing the mathematics of the DFT and a first look at some of its applications. 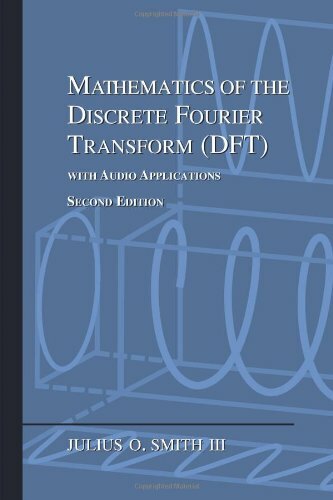 The sequel consists of appendices which fill in more elementary background and supplement the prior development with related new topics, such as the Fourier transform and FFT algorithm. For further study, one may, of course, continue on to Book II (Introduction to Digital Filter Theory ) in the music signal processing series (mentioned in the preface). Alternatively and in addition, the references cited in the bibliography can provide further guidance.